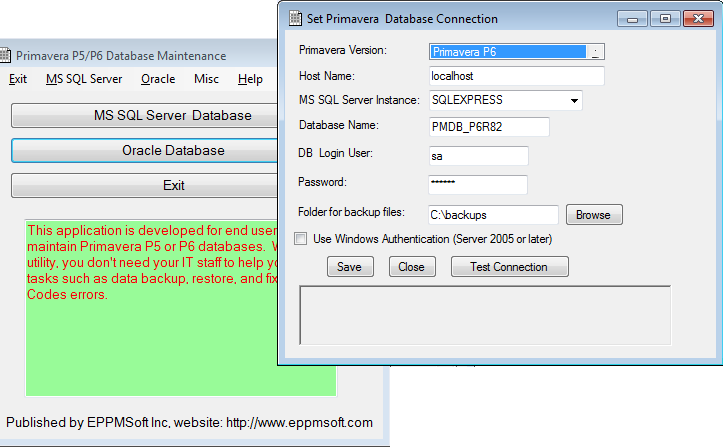 Backup and restoer Primavera P6 backend databases. Mass import and export projects, and keep EPS/WBS hierarchy. Migrate your projects from one database to another database regardless of the database versions or vendors. Copy projects from Primavera lower version (P6.2 ) to higher version (v7.0 or R8.3) vice versa. 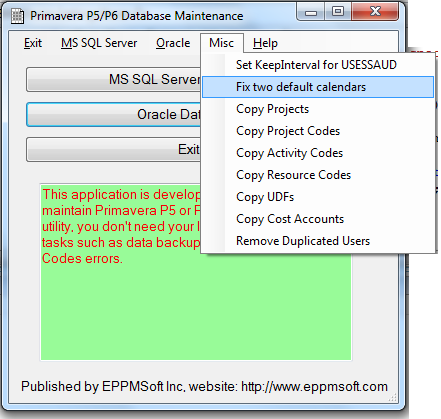 Copy Project Codes, Activity Codes, Resource Codes, UDFs, Cost Accounts, Roles, Resources, or Resource curves from one database to another database regardless Primavera version . Fixed notorious Primavera Event Codes errors. Fixed Bad Pubuser Name or Password error, or bad Privuser Name or Password error. Fix two default calendars which cause Web Access login failure. Bellow is the proudct screen shot. Unable to view the predecessor pop-up menu when I select assign button. How can i get the licence of primevera db tool.